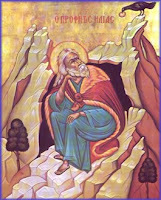 Reflections from Australia: The prophet ..
A prophet is in the first place one who is close to God - he lives on the mountaintop of the inner life. He is one who can see in the dark - whose eyes pierce the obscurity created by facts and public opinion. A prophet is that rare man who can say of himself: I am not confused. Nor can a prophet be misled or disturbed or awed by loud voices or appearances because he has the gift which allows him to identify and keep his eyes on the truth of every matter. A man who can see where the road of history is taking humanity - a man who can see the ultimate consequences of the things we begin to do. A prophet is a man inspired - that is, he sees as God sees - from within - from above - clearly. A prophet is always confronting because he speaks truths that are hidden - which take us by surprise - which catch us off guard - which go against the popular and the common. Therefore we are tempted to dismiss him. His words are confronting because they are always about the God we forget or about us, whom we think we know. His words claim to come from God - so in dismissing a true prophet we are rejecting God and his truth - his truthful word. A prophet says precisely what we do not wish to hear. He spoils our fun - he warns us of consequences we deny - he tells us we are wrong. A prophet speaks of disaster because he speaks of sin - a disaster we bring on ourselves from within - it is our disaster - contained within ourselves - approaching from afar - made history in our actions. A prophet doesn't fit in to our world view - just like the truth - or the disaster he warns of. Therefore a prophet is never welcome - he must be eliminated from the scene. He is the future come to meet us - our future - the one we are creating. He tells us the meaning of what we do today - and the future it will give birth to. A prophet will not go away - ever - just like the truth. He will not desist - he cannot be bought off - he must be killed - but only to make way for the next prophet. Scorn, ridicule, contempt, rejection are the daily food of the prophet. A man driven - who refuses to subscribe to the consensus, the popular, the 'chummy' atmosphere. A prophet is the arch-enemy of the liar - even should the liar be an entire nation - a whole planet - he still overturns us. The prophet is a sentry who never sleeps. He warns us about the enemy who approaches from afar - the one who emerges from within us - who is acting in our actions - fuelled by the power of our disordered hearts. The prophet is therefore always warning us about ourselves who are so ready to displease God - to find our own way. A prophet cares for us and about us - he loves us. He has responsibility for us because he is one of us. He takes us more seriously than we take ourselves. He is our shepherd - the shepherd of of God's flock. A prophet is powerful because he is 'under orders' - 'sent' - he has to answer to God for his actions and words - which he takes from God. His life is bound to ours. A prophet is a man trapped. If he does not speak the word which turns us against him - the word itself will turn on him. He is trapped by truth and we are trapped by - error. A prophet does what he calls us to do. He is close to God and calls us to be close to God - to listen and obey. A prophet calls us to be reconciled to God - and to one another. This will be printed out and kept. I was complaining to my pastor one day about somebody giving me problems. My pastor just looked at me and said, "That's because you are a prophet, and folks don't always like prophets." So many prophets (one who speaks the truth) need to realize their calling and get with this "propheting" business.